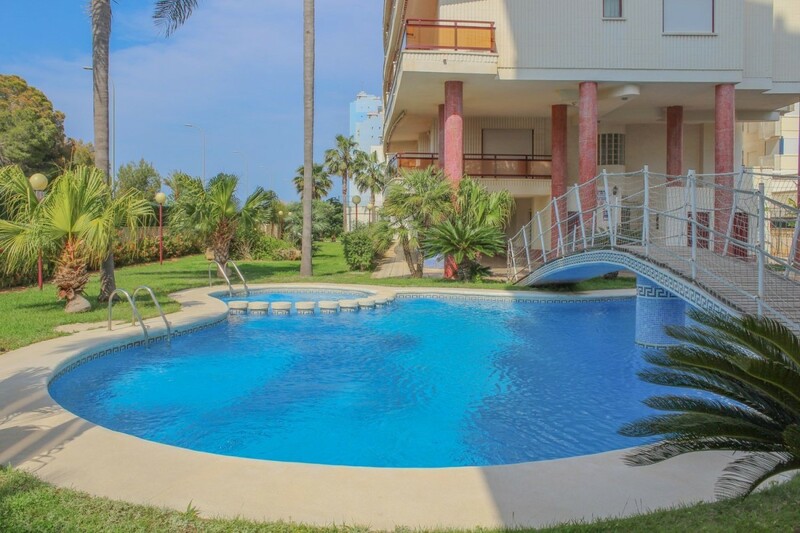 apartment for sale with very good location on the second floor of the Building Les Llomes in the university area, near the beach, the port and the Grao de Gandia. The house has good distribution and has 2 bedrooms, living room, kitchen and terrace with access to double room and lounge. It is a modern apartment in very good condition, suitable as second-hand housing or to enter to live for the whole year. Lets rent throughout the year, whether for students, for temporary tourism or a year for a small family. Les Llomes is a private, quiet and safe residential that includes a patio, garden and communal pool. All services are within reach and there is a good connection to Cullera and Oliva along the N332 national road and to Alicante and Valencia via the AP7 motorway. The area has supermarkets, bars and restaurants in addition to all the essential services throughout the year and there are shopping centers and hospital 15 min. by car From Gandía there is a local train service that goes to Valencia, passing through Cullera. There is also bus service. It is a good opportunity as an investment that offers good possibilities of profitability. Better to see it! This renovated house of 112m2, (79m2 useful, 13m2 terrace and 20m2 of common elements) built in 2001, is as new, very well maintained and with superior qualities, furnished and ready to move in as a permanent occupation or as a second residence tour. This property is very bright, with many windows that overlook beautiful views. The apartment has a large terrace in an "L" shaped corner, with views of the mountains, the sea and the beach. There is a suite room, with an integrated bathroom, a double room and a single room. There are two bathrooms, one integrated into the suite and another for general use. The independent kitchen next to the gallery is fully equipped with appliances. The living room gives direct access to the terrace, as does the main room. Air conditioning hot / cold. The offer includes a large open parking space of 24m2. It includes a communal area with: large garden, gym, sauna, tennis court and common pool, one for adults and another small one for children. The apartment has access for the disabled and is accessible both by stairs and by elevator. 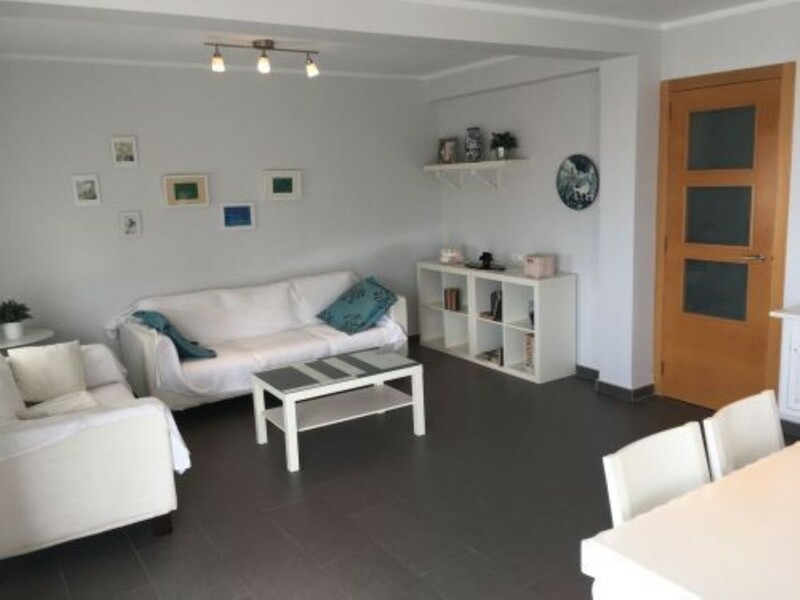 Located near the center of Gandia, and with good connection to Valencia via the N-332, the AP7 motorway, public transport bus and commuter train. It is a very quiet area, with wonderful and incomparable views, good for investments and to get good profitability in the coastal area. Here we find luxury and comfort next to the beach. Come and see it! Exterior housing with many possibilities in the center of Gandia, near the train and bus station, supermarkets, parks and medical centers 10 minutes from the beach. Large bright patio equipped with two elevators. The house is composed of three bedrooms with beautiful views of the mountain, two of them double with fitted wardrobes and double glazing. Large kitchen and gallery. 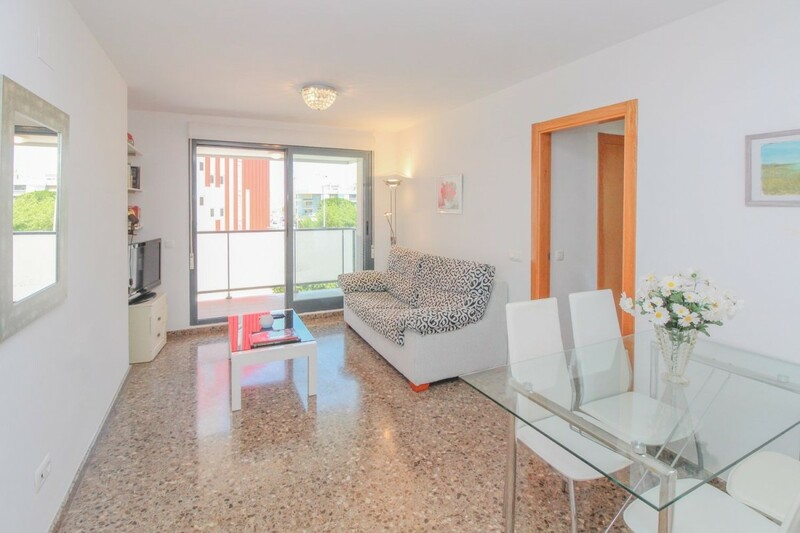 It has a large living room with lots of light and a balcony open to Cardenal Cisneros street. Ask about our services in reforms and projects without commitment. Do not hesitate to visit the house without any commitment. Your advisor will be happy to inform you and help you in the management. ". • "URBANIZATION XERESA DEL MONTE, NOW ON SALE NEW PROMOTION IN PROGRESS. The Resort consists of apartments, penthouses and duplex. LATEST HOUSING! Homes of 1, 2 and 3 bedrooms according to typology. All homes have a parking space and storage room. Elevator for access to elevated areas. Design and construction terraced, modern look, adapted to the typography of the natural environment, also have all the comforts and excellent qualities. Large terraces of up to 50 m2. Large windows so that all the main rooms have maximum direct lighting. Pre-installation of air conditioning. The complex will consist of Social Club with multipurpose rooms, common leisure center, gym, sports courts and cafeteria. Garden areas, playground and swimming area with several pools for all ages adapted for people with reduced mobility. Private access to the urbanization. The urbanization Xeresa del Monte is 30 minutes from Valencia and 70 km. from the airport, next to the AP7 motorway. It is located on the slope of the Mondúver Natural Park, with dream views of the coast. The beaches of Gandia and Xeraco are a few minutes drive from the urbanization. ". Housing located on a seventh floor of a total of eight heights, its orientation allows you to enjoy views of the sea and the mountains. 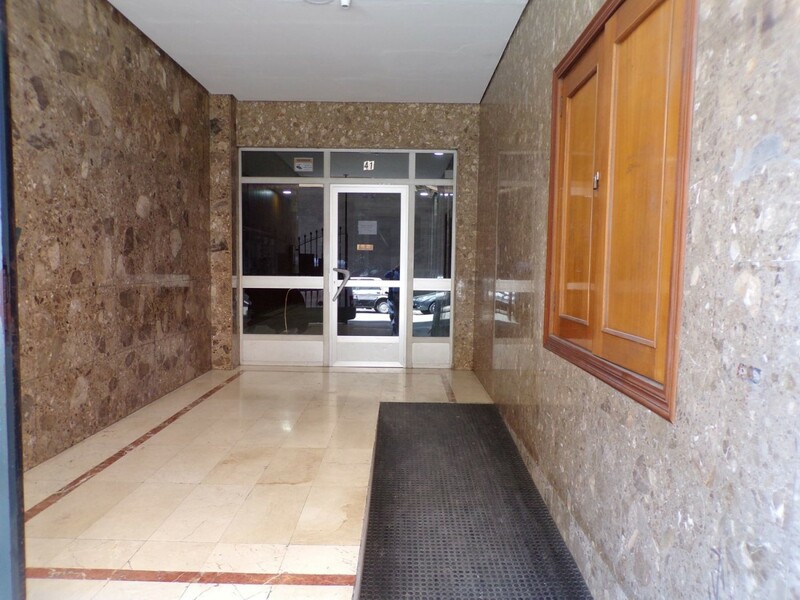 Building located in the heart of Gandia beach, surrounded by green areas, parks, shops and restaurants. The house has two bedrooms, bathroom, living room and kitchen with laundry, also has a large terrace that surrounds it to enjoy the views. The urbanization has a swimming pool and green areas, has parking space (included in the price). It is ideal to enjoy the beach all year round. 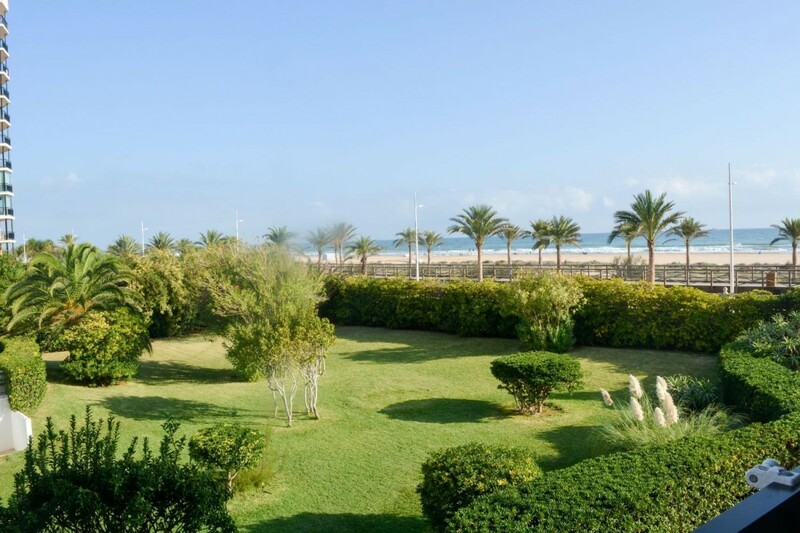 "Fantastic exterior apartment in the Ducal area of Playa de Gandía, with fantastic side views of the beach and the sea, with a magnificent outdoor terrace. A few meters from the sea and the beach (less than 100 meters). 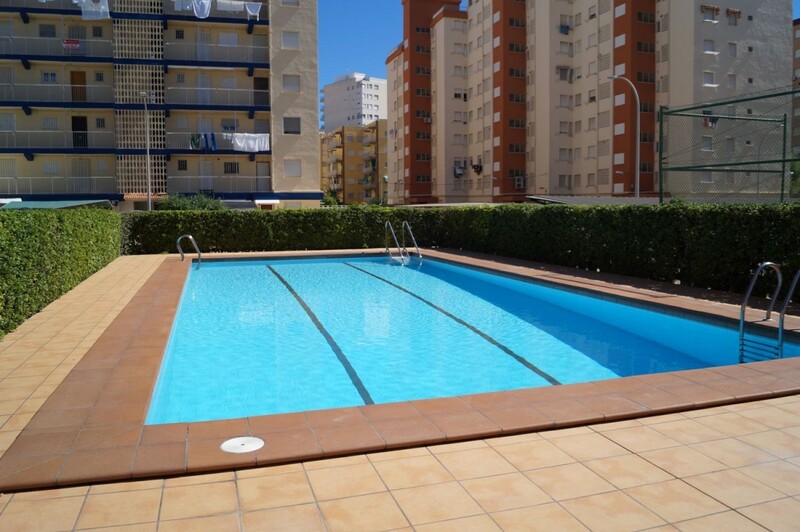 It is located in one of the best residential areas of Gandia, with all services at a few meters. The house completely renovated, has a large living room, 2 bedrooms, and kitchen. Previous to the reform there were 3 bedrooms, now there are 2, but you can easily do 3 again. It is a very bright house in a quiet neighborhood. It has many possibilities. A great investment opportunity. It has air conditioning, fitted wardrobes and full kitchen. House with many possibilities to make different spaces in it. Visits are also made even on weekends. If at any time you need it, we HELP you and FACILITATE FINANCING as long as you meet the requirements. "The specific data on the property published, can be approximate, therefore they are not binding or contractual, are shown for information. " Taxes and expenses NOT INCLUDED: ITP or VAT, Notary, Registry, agency, valuation, etc.. . * The images / Infographics contained in the advertisement are sketches that are not binding, it is simply informative. "The floor with which he has always dreamed, is an opportunity that can not be missed. " Call us and we will give you an appointment to visit and acquire the property you have always dreamed of. ". Apartment for sale a few meters from the Paseo Marítimo de Gandía. Exterior floor corner of 105 square meters, closed urbanization with large pool, large common areas and garage. The property has a spacious living room with access to a terrace overlooking the common areas, fully equipped kitchen, three bedrooms with fitted wardrobes and two bathrooms, one en suite. The location of this bright apartment will allow you to leave your car parked in your garage, and walk anywhere as it is just 400 meters from the beach and is next to restaurants, supermarkets, entertainment venues, playgrounds and summer cinema. Do not miss this opportunity, call us and we inform you! Spectacular footstep facing the sea, with incredible views and ready to enter to enjoy all your comfort. Do you want a paradisiacal, comfortable place, that provides you rest and relaxation; that you do not have to do anything else than carry your personal things, with the sea accompanying, and very close to Valencia? YOU´VE GOT IT.. . Located in Gandia Playa, 45 minutes from Valencia, and in a residential "literally" by the sea, is this fabulous apartment. It has 139 M2 distributed in 3 bedrooms (1 en suite and with access to terrace overlooking the sea), 2 bathrooms, fully fitted kitchen including appliances, gallery, living room; and what is priceless! a spectacular terrace with unique views of the sea, to sit and enjoy sunrises or sunsets, whatever you prefer.. . The terrace also has a direct view of the pool, with which you can have full control of the children. 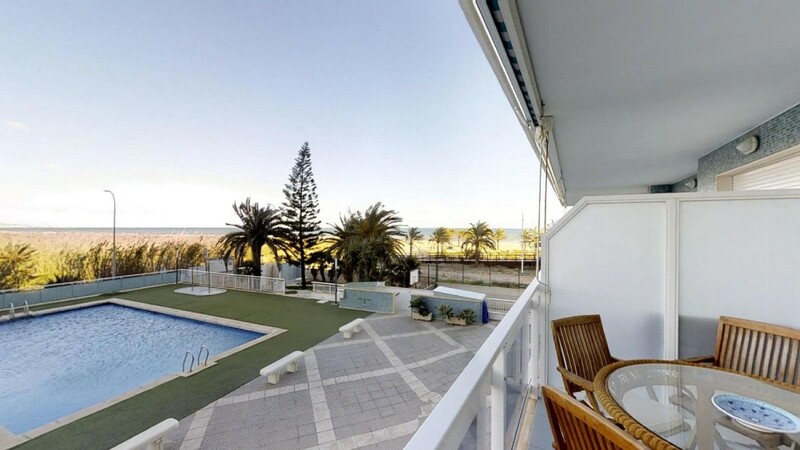 The residential, 2001 offers fabulous common areas: swimming pool surrounded by gardens and overlooking the sea, paddle, gym, wifi room and doorman. Po its excellent location, just outside the residential, you are on the beach. Of the best beaches in the Region of Valencia, with walkways to enjoy the sea air and exercise. In addition, the apartment is sold with garage and storage room included in the price. It is a fabulous opportunity to stay with a super floor, which you can enjoy in any season of the year. EXCEPTIONAL APARTMENT 174 m2! In front of Gandía Beach in one of the most exclusive urbanizations of the area. From the apartment you can see the beach and the sea. 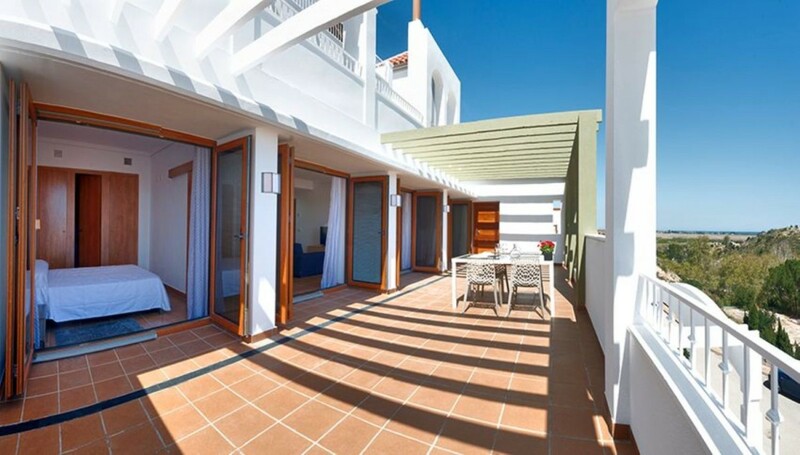 It has direct access from the door to the beach The price also includes a surface area in the building itself. The apartment has an entrance hall, living - dining room, fitted kitchen, 4 bedrooms, 2 bathrooms and a guest toilet. All rooms are facing the beach. 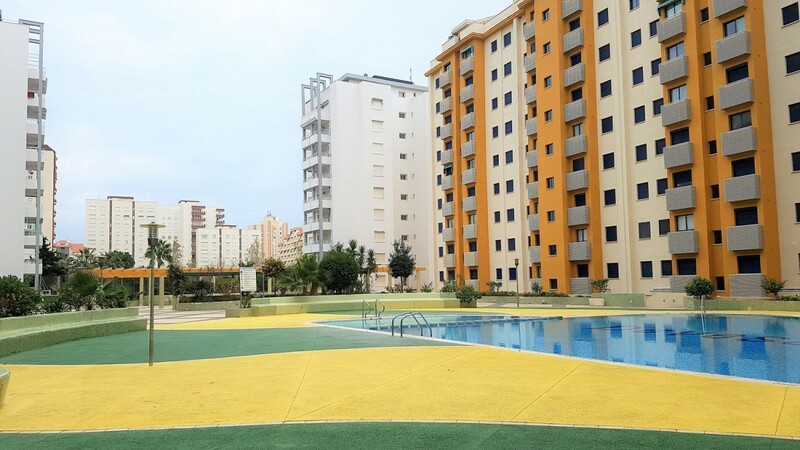 It has a large garden, communal areas, children´s area, social club and a pool of 25 meters. It is a magnificent opportunity to enjoy one of the best beaches in Spain.